There’s some good news for consumers in Montana and Wyoming, as it’s been revealed that T-Mobile is building out new cell sites in the two states. T-Mobile is building around 200 new cell sites in Montana and northern Wyoming, according to the Missoulian. T-Mobile is teaming with Blackfoot, who will provide fiber backhaul services. Some of the cities that’ll see the benefits of this expansion include Bozeman, Great Falls, and Billings. This partnership will also result in extended service in Helena and Butte. 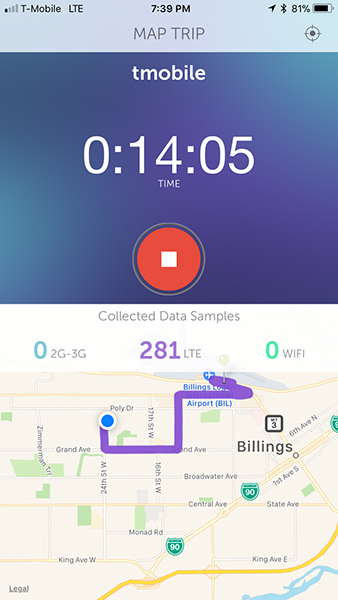 TmoNews reader Arthur was in Billings, Montana, this week and says that he spotted some T-Mobile LTE coverage for the first time. He does note that coverage is still spotty for the time being, though. More LTE coverage is always a good thing, and this expansion includes the large city of Billings and the city of Butte, which is home to Montana Tech. So if you live in these parts of Montana or northern Wyoming and you’ve been interested in trying out T-Mobile, you’ll soon have the chance. Been waiting for Bozeman for years. Nothing like blowing through your off-network data allowance within a few minutes of arriving in town. To T-Mobile’s credit, I will add that voice coverage has never been all that terrible in Montana and Wyoming. Not the best but if you’re on a major highway or in a larger city, you have at least some kind of voice capability. I’m sure this buildout will go a long way towards dumping AT&T as a roaming partner. Come build some in Chicago as downtown area is brutal! They can’t for the safety of their employees. T-Mobile is in Chicago right now. Adding & updating!! Arthur here. Just to clarify the coverage update: so far the signal is showing up in Billings Heights area (near downtown, north and northeast). At the West End, I am still using AT&T roaming. I would’ve presume these are (I am not really an expert on bands) band 12 and 17. I will go ahead and map the coverage over time as more and more T-Mobile LTE lit up in my area. They need to expand around Jackson, WY too, where coverage is poor. AT&T’s CEO has a house there, so their coverage is great. About time. I was just through Wyoming and Montana this past July and I was roaming a lot. As well as Kansas and eastern Colorado which Tmo says should be covered already. It’s a start. I like my 55+ plan and want to keep it when wife and I retire to central Wyoming in a few years. So — faster, please.